WHAT ARE THE BEST ONLINE MASTER'S IN ENGINEERING MANAGEMENT PROGRAMS? What Else can I Expect from an Online Master's in Engineering Management Program? If you studied engineering or architecture as an undergraduate -- and now work in the industry -- an online master of engineering management degree may be a perfect opportunity to expand your career opportunities while developing your business acumen. The role of an architecture or engineering manager weds the field of engineering and planning with the skills of business and project management. According to the U.S. Bureau of Labor Statistics, the median salary for an architecture or engineering manager is more than $130,000, and the field is expected to grow between now and 2024. This multidisciplinary degree adds value to your current firm, or gives you the tools to establish your own business. Many areas of engineering, including structural and transportation, require someone who grasps both the science of engineering and the business savvy to execute plans. A master of engineering management builds on a student's professional experience by developing the necessary qualifications to be a designated project manager and leader. Online master of engineering management graduates are attractive job candidates, and they can find work as managers, coordinators, and planners in a number of engineering positions. Most engineering management master's programs require at least some professional experience at an engineering or architecture firm. Undergraduate degrees in the field are also typically prerequisites for enrollment. CAN I WORK WHILE I COMPLETE MY ONLINE MASTER'S in ENGINEERING MANAGEMENT? Yes. Many online master of engineering management degree students work while they earn their degrees. Many programs are taught in the evenings, on weekends, or on-demand. While a full-time program can be completed more quickly, part-time formats allow students to work full-time during the academic year. WHAT ARE THE ADVANTAGES TO EARNING MY MASTER'S IN ENGINEERING MANAGEMENT ONLINE? Online education can be a terrific format for an engineering management master's. In addition to providing students the flexibility to work while earning their degree, online education allows students to complete their degree at an institution which suits their personal and professional goals, regardless of geographic location. Online programs may also be completed more quickly than some on-campus counterparts. JHU offers an online master's of engineering management that allows students to choose one of 13 concentrations on subjects like applied physics and structural engineering. This online engineering degree includes 10 courses split between core and concentration classes. The curriculum includes core courses on a variety of topics, such as project management, executive technical leadership, and business law for technical professionals. Students learn how to thrive in technology-driven industries, and the course on applied innovation familiarizes them with culturally-inclusive creative processes. Distance learners must complete their degree within five years of admission. Applicants must have a bachelor's degree (or be in the final semester of their program) from a regionally accredited university with a minimum GPA of 3.0 to be considered. JHU is accredited by the Middle States Commission on Higher Education. SIT offers a master's of engineering management that prepares students for careers as data analysts, project managers, application engineers, and more. Graduates know how to effectively explain technical concepts and have gone on to positions with corporations like BMW, IBM, and UPS. The 30-credit curriculum includes six core courses and four elective courses. These courses cover a variety of topics, including decision and risk analysis, informatics, project management, development enterprise, and elements of operations research. Students have the opportunity to integrate their electives into a four-course sequence that allows them to earn a graduate certificate in addition to their degree in engineering management. Applicants must submit an online application, two letters of recommendation, official transcripts, and GRE or GMAT test scores to be considered. SIT is accredited by the Middle States Commission on Higher Education. USF offers an online master's of engineering management degree with the following areas of specialization: technical management, quality management, safety management, systems engineering, entrepreneurship, or regulatory affairs for medical devices. The 30-credit curriculum includes three core areas: general, quantitative, and workforce management. General core courses emphasize the principles of engineering and provide an in-depth examination of policies and strategies. The workforce management core prepares students for leadership roles in engineering and includes coursework that focuses on human relations and work design. Finally, the quantitative core emphasizes operations research and statistical design models. The MS in engineering management combines disciplines to provide students with a comprehensive understanding of technical and managerial approaches to engineering. USF boasts more than 800 global graduates who work for corporations including Disney, Universal Studios, and Citibank. Applicants must have at least two years of engineering or management work experience and submit official transcripts and GRE scores to be considered. USF is accredited by the Southern Association of Colleges and Schools Commission on Colleges. Missouri S&T offers a 30-credit online master's of engineering management that draws upon theories of engineering, management, and technology to prepare students for careers in a variety of technology-driven environments. Students must choose one of six specializations: financial engineering, industrial engineering, management of technology, manufacturing systems, project management, and quality engineering. This interdisciplinary program includes four core courses on topics such as operations management science and project management. Students must also complete four specialization courses and two electives. Students in this MS in engineering management program have online access to a library, bookstore, and career center services. Applicants must have a bachelor's degree in engineering, math, or physical science with a minimum GPA of 3.0 to be considered. They must also submit official transcripts, an online application, a resume, three letters of recommendation, a statement of purpose, and GRE/GMAT scores. Missouri S&T is accredited by the Higher Learning Commission. Rowan offers a master’s in engineering management online that is ideal for technical professionals who want to advance their careers. This 30-credit program offers online coursework in an accelerated, part-time format. Students can earn their degree in less than two years as long as they enroll in two courses per semester. Courses each last eight weeks and new assignments. Each course is eight weeks long, with new assignments available every Tuesday and due the following Monday. The curriculum includes courses on a variety of topics, such as engineering economics, strategic risk management, and engineering decision making. The facilities management course familiarizes students with several types of facilities and their components, such as inventory, electricity, and EPA requirements. Students also learn how to oversee facility maintenance, contracts, and safety. Applicants to this master's of engineering management program must have a bachelor's degree and have completed undergraduate coursework in chemistry, physics, calculus, and statistics to be considered. Rowan is accredited by the Middle States Association of Colleges and Schools. UHCL offers a master's of engineering management program that emphasizes experiential learning and prepares students for careers in logistics, manufacturing management, technical consulting, and more. Full-time students enroll in three courses per semester and earn their degree in 15-16 months, while part-time learners only enroll in two courses per semester and finish in 24 months. The 36-credit curriculum includes 21 credits of core coursework, 12 credits of electives, and a three-credit capstone project. Students can also pursue a thesis option that includes nine credits of electives and a six-credit capstone project. Coursework cover a variety of topics, including engineer management planning, human behavior in organizations, and professional project management. This engineering management MS online offers three start dates in the spring, summer, and fall semesters. Applicants must have a bachelor's degree in engineering or science with a minimum GPA of 3.0 to be considered. UHCL is accredited by the Southern Association of Colleges and Schools Commission on Colleges. UNC Charlotte offers an online master's of science in engineering management degree with start dates in the fall, spring, and summer semesters. Students must choose one of three concentrations: energy systems, lean six sigma, or systems analytics/logistics and supply chains. This 30-credit program includes courses on training in operational issues, business and technical management, and organizational decision making. This flexible program allow students to quickly earn their degree in just one year with the fast-track option. They can also take one course per semester and graduate in three years. Applicants must have a bachelor's degree in engineering or a similar field, or a bachelor's degree in business with completed technical requirements to be considered. They must have a minimum GPA of 3.0 in required coursework in engineering economics, calculus, and statistics. Finally, they must submit GRE or GMAT scores that are less than five years old. UNC Charlotte is accredited by the Southern Association of Colleges and Schools Commission on Colleges. Drexel's master's of engineering management is the oldest in the nation. The program delivers an innovative online experience that prepares students for leadership roles in the fields of engineering and science. The 45-credit curriculum includes coursework on a variety of topics, such as engineering management, quantitative analysis, financial management. Students also enroll in 15 credits of electives on topics like marketing, business development, and engineering law and ethics. Finally, they must also complete a culminating capstone course at the end of the program. Applicants to this MS in engineering management must have a bachelor's degree in engineering or science from an ABET-accredited program with a minimum GPA of 3.0 to be considered. Drexel recommends that applicant shave at least five years of relevant work experience, but it is not required. Drexel is accredited by the Middle States Commission on Higher Education. NMT offers a master's of engineering management that can be completed entirely online in a live virtual classroom. Courses are streamed live online and students can be access them on their computers and mobile devices. Synchronous courses are delivered on Monday-Thursday for three hours in the evening. The 30-credit curriculum includes courses on a variety of topics, such as quantitative and qualitative methods, and must complete a culminating capstone project during their final semester. Applicants must have a bachelor's degree in engineering or a related applied science to be considered. Preference is given to applicants who have at least two years of engineering or applied science work experience. Admitted students form a graduate committee that assists in the selection of electives and a final project. NMT is accredited by the North Central Association of Colleges and Secondary Schools. Louisiana Tech offers an online master's of engineering management that is taught by a diverse faculty with training in engineering, business, and management. This program emphasizes systems design, project management, and financial analysis and prepares students for careers in the applied science industry. Past graduates have gone on to positions with the U.S. Air Force, QSSI, and Entergy. Students must choose whether to concentrate in engineering management or management of technology. This 33-credit program includes 21 credits of core coursework and 12 credits of electives. Coursework covers a variety of topics, such as quantitative analysis and management, science, engineering, and entrepreneurship, logistics planning, and industrial psychology. Core coursework also familiarizes students with statistical analysis for six sigma and operations research methods. Louisiana Tech is accredited by the Southern Association of Colleges and Schools Commission on Colleges. RMU offers an engineering management master’s degree that can be completed entirely online. This 30-credit program integrates technical and leadership concepts along with the theoretical and practical knowledge needed to design and operate engineering management systems. All students must complete three core courses that focus on analysis, cost estimation, and implementation of engineered systems. These courses teach students how to strategically manage technical projects and acquire skills in budgeting, planning, and evaluation. Students must complete 21 credits of electives that are selected with the help of an academic adviser. These electives cover a variety of topics ranging from system simulation to health and safety management. The robotics and automation course examines principles used in assembly and inspection and teaches students how to develop applications to optimize industrial processes. The school's online learning environment promotes student engagement and personalized attention with online courses delivered through Blackboard. RMU is accredited by the Higher Learning Commission. CBU offers a master's of science in engineering management that is ideal for working professionals. This fully online program uses recorded lectures, discussion forums, chat sessions, and email to provide students with course material and connect them with their peers and instructors. Many professors host optional live meetings throughout the semester at different global locations for students who want to meet their instructors in-person. The 33-credit MSEM program offers both a thesis and non-thesis option. CBU recommends the non-thesis track for working professionals and the thesis track for full-time students or individuals interested in careers in research. Students in the thesis track must enroll in six credits of thesis-related coursework, while non-thesis students only enroll in a three-credit capstone project. Both tracks include 21 credits of core coursework on topics such as quality assurance and engineering law. CBU is accredited by the Southern Association of Colleges and Schools Commission on Colleges. UM–Dearborn offers an online master's of engineering management that prepares students to lead groups of engineers. Students learn how to oversee lower- and upper-level engineering management functions and how to address a variety of topics, including systems engineering, production management, and quality management. The program emphasizes the integration of management and technical knowledge to provide students with the skills needed to pursue technical leadership roles in marketing, business law, and organizational behavior. All students must complete a prerequisite course in calculus-based probability and statistics. The 35-credit curriculum consists of 18 credits of engineering requirements, 12 business credits, a capstone project, an elective course, and an optional thesis. Available electives cover a wide range of topics, including human factors, ergonomics, and vehicle packaging engineering. Students in the thesis option do not have to complete a capstone project or an elective course. UM–Dearborn is accredited by the Higher Learning Commission. UA offers an online master's of engineering management that is ideal for working professionals who want to advance their career. This program can be completed in two years and offers start dates in the fall and spring semesters. The curriculum includes coursework on a variety of topics, such as quality engineering, reliability engineering, technical sales and marketing, and engineering statistics. Applicants must have a bachelor's degree in engineering or a related field, such as math or physics, with a minimum GPA of 3.0 to be considered. Those with a low GPA may enroll as non-degree seeking students and earn 12 credits with a minimum GPA of 3.0 to qualify. They must also submit official transcripts, an online application, three letters of recommendation, a resume, and a statement of intent. UA is accredited by the Higher Learning Commission. WSU offers an online master's of engineering and technology management program that allows students to advance their career while continuing to work full-time. Online courses are delivered through Blackboard Collaborate in real-time using video conferencing and spontaneous file sharing features. Distance learners can also use this software to give presentations and participate in group work remotely. This 33-credit program consists of 10 courses and either a capstone project or a culminating case-study. Coursework covers six core areas of management: organizations and people, financial resources, analytical methods, project, variability, and strategy. Students must also complete four electives courses on a variety of topics, such as enterprise resource management and system supportability. Applicants must have a bachelor's degree from an accredited program with a minimum GPA of 3.0 and significant work experience to be considered. WSU is accredited by the Northwest Commission on Colleges and Universities. K-State offers an online engineering management master’s program that prepares students for technical management careers in a variety of settings including government agencies, small and large scale manufacturing, service organizations, and health care. This 30-credit master's of engineering management program is geared toward working professionals and designed to be completed in two to four years of part-time study. This program consists of 15 core credits and 15 elective credits. Core coursework focuses on theories and techniques of management in a technical environment, such as advanced industrial management, engineering economy, and quantitative problem solving. Electives may be taken from other disciplines, such as psychology or business, and must be approved by a student's academic adviser. Online coursework is delivered through K-State Online, and learning materials range from lectures and readings to videos and discussion boards. K-State is accredited by the Higher Learning Commission. CMU offers a master's of engineering management that can be completed entirely online. This 36-credit program emphasizes financial analysis and planning, project management, and lean manufacturing. The curriculum includes 15 credits of core coursework, 18 credit of major requirements, and a three-credit capstone course. Coursework covers a variety of topics, including technical management and strategic planning and best practices. Graduates are prepared to pursue careers as professional administrators in both public and nonprofit sectors. Applicants to this master's of science in administration-engineering management program must have a bachelor's degree with a minimum GPA of 2.7 to be considered. They must also submit official transcripts and a statement of purpose. The program recommends that students have completed prerequisite coursework in statistics and accounting. CMU is accredited by the Higher Learning Commission. A-State offers an online engineering management master’s degree that can be completed in just 14 months. This program was developed for engineers with professional management goals and takes an interdisciplinary approach to technical management, allowing students to gain skills in areas such as accounting, finance, and engineering statistics. The emphasizes subjects like political science, journalism, and business administration in addition to engineering coursework. The program includes two engineering management courses that examine core principles like planning, controlling, and motivating. This 30-credit program includes 11 seven-week courses on a variety of topics, such as marketing management, globalization, and managing technology in the digital age. This master's of engineering management program offers three start dates in the spring, summer, and fall. All online students pay the same tuition rate, regardless of residency. A-State is accredited by the Higher Learning Commission. NU offers an online master's of science in engineering management with four specializations: enterprise architecture, project management, systems engineering, and technology management. This program teaches students the strong quantitative analytical skills and techniques needed to manage engineering projects. The program’s multidisciplinary approach integrates principles of engineering, management, and risk analysis. The 63-quarter unit curriculum includes eight core courses and four classes in a student's chosen specialization. Enterprise architecture majors are required to enroll in an additional course on operation management. They must also complete two capstone courses that require students to select a research project, college and analyze data, and then present their findings. Transfer students can apply up to 13.5 quarter units towards their degree. Applicants must have a bachelor's degree in engineering, engineering technology, or physical sciences from an accredited institution to be considered. NU is accredited by the Western Association of Schools and Colleges. Lawrence Tech offers an online master's of engineering management degree that can be completed in two years. Community leaders in engineering, manufacturing, and technology serve on the program’s advisory board and help guide program curriculum by providing real-world technical leadership expertise. This program emphasizes enterprise productivity, supply chain management, and production planning and control. This 36-credit program includes seven core courses and five elective courses. Coursework cover a variety of topics, including strategic planning, six sigma processes, and collective bargaining. Students interested in applied stochastic processes have the opportunity to learn how to apply models to solve problems in service operations. Electives range from engineering economics to global leadership, and students can take courses in other engineering and applied science programs with approval from the program director. All online students pay the same tuition rate, regardless of residency. Lawrence Tech is accredited by the Higher Learning Commission. SDSM&T offers an online master’s in management science and engineering program that emphasizes multidisciplinary practical skills in areas of management, engineering, and operations research. This 32-credit program emphasizes four core areas: business/finance, management, quantitative methods, and operations management. Students must complete at least one course in each core area as they gain skills in business strategy, project planning, and quality management. The program offers electives designed to fit students’ unique career interests with topics such as industrial hygiene, ergonomics, and safety management. Online coursework is delivered in both synchronous and asynchronous formats. Students can virtually attend class and review recorded lectures at their convenience. Applicants to this engineering management MS program must have a bachelor's degree from an accredited institution with at least a year of coursework in mathematics and three credits in probability and statistics to be considered. Transfer students can apply up to 12 credits toward their degree. SDSM&T is accredited by the Higher Learning Commission. OU offers an engineering management master’s degree through the school's department of engineering and school of business administration. The online curriculum includes four management courses, four engineering classes, an elective course, and one theory class. Management courses cover topics like financial accounting and organizational behavior and teach students how to make management decisions in financial and marketing management positions. The engineering coursework emphasizes foundational concepts and process and familiarizes students with statistical quality analysis and E-commerce. Students can choose an elective course in managerial accounting, economics, or any course not yet taken in engineering or management. Finally, the theory course examines statistical methods used in engineering. This program offers start dates in September, January, and May each year. Applicants must submit official transcripts and two letters of recommendation to be considered. OU is accredited by the Higher Learning Commission. WNE offers an online master's of science in engineering management that emphasizes organizational efficiency, safety, and growth. Coursework is delivered through the university's online learning management system KODIAK. Assignments are submitted through the online classroom, where students engage in discussions with classmates, communicate with professors, and access lectures. Graduates are prepared to plan, design, and lead technical projects in a variety of engineering settings. Applicants must have a bachelor's degree from an accredited institution in engineering or a related discipline with a minimum GPA of 3.0 to be considered. Those with a GPA between 2.7 and 2.99 may be granted conditional admittance. Candidates whose degree is not accredited by the Accreditation Board for Engineering and Technology must also submit recent GRE scores. WNE is accredited by the New England Association of Schools and Colleges. EMU offers an online master's of science in engineering management with four available concentrations: research and development, design and manufacturing, project/program management, and lean enterprise systems. These concentrations prepare students for international professional certification. Each concentration includes the same 21 credits of core coursework and 17-18 credits of concentration classes. This program emphasizes the integration of engineering and enterprise and teaches students skills in data and process modeling, cloud computing, and global manufacturing. Applicants must have a bachelor's degree in an industrial or technical field with a GPA of at least 2.7 to be considered. Undergraduate students who are in their final year may enroll in this graduate program with conditional admission. Those with a GPA lower than 2.7 may also apply for conditional admission. EMU is accredited by the Higher Learning Commission. LU offers a master’s in engineering management online that equips engineering professionals with the expertise needed to pursue a variety of technical management positions. This program can be completed in 18-24 months of part-time study. This 36-credit program includes 14 credits of core coursework, with four courses from LU’s engineering department and one course from its business school. The remaining courses consist of engineering and business electives that allow students to customize their degree to fit their career goals. Transfer students may apply up to six credits toward their degree. Applicants must have a bachelor's degree in engineering or a related discipline, previous leadership experience, and submit GRE scores and a letter of recommendation from their supervising employer to be considered. Students with undergraduate degrees in other disciplines may be eligible for the program after meeting required prerequisites. LU is accredited by the Southern Association of Colleges and Schools Commission on Colleges. While all online master's of engineering management degrees prepare graduates for business and engineering aspects of a project, each program is created differently. Individual programs differ in their focus and expertise, which depends on the courses offered, the school's faculty, and the available concentrations. Similarly, programs may feature different completion times, credit requirements, application processes, curricula, and final projects. It is important to investigate each program carefully to ensure their offerings align with your goals and learning styles. Project Management for Engineers: Most enrollees in an online master's in engineering management program can expect a project management class. From learning about human management techniques and organization leadership to understanding the components of engineering planning, this is a foundational class in the program. Economic Planning: While undergraduate engineering students are usually familiar with math, financial planning is usually not typically part of their curriculum. With an MS in engineering management, students learn to work with budgets, accounting, and financial project planning. Business Law and Ethics: These courses introduce students to engineering management and best practices, and may be focused on a specific industry, such as structural engineering or software law. HOW LONG DOES IT TAKE TO GET AN ONLINE MASTER'S IN ENGINEERING MANAGEMENT? 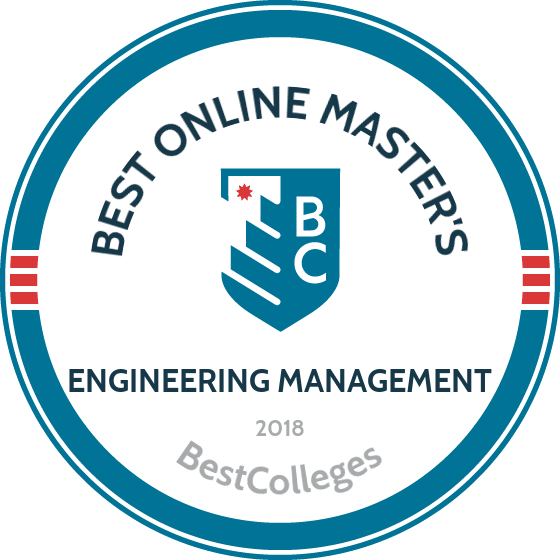 The specifics of each individual master's in engineering management online program vary, but most are completed in two years and require between 30 and 36 credits. The biggest factor in completion time is whether a student enrolls part- or full-time. Full-time can take two years or less, while part-time completion depends on a student's pace. Additional factors, such as transfer credits, master's theses or final projects, and term length can also impact completion time. Instructional format plays a role, as well. A cohort model places students in a group, which then matriculates together throughout the degree. This allows for increased academic support and a more reliable schedule. An individually paced schedule, however, lets students move through course material as slowly or quickly as he or she would like. The Professional Engineer -- or PE -- designation is given to working engineers who have completed the fundamentals of engineering exam, have significant professional experience and/or a master's degree, and passed the Principles and Practice of Engineering Exam. The exam, given by the National Council of Examiners for Engineering and Surveying, is required to receive an engineer stamp. However, it may not be required for all project management jobs. One of the most important factors in choosing a master of engineering management online degree is the school's accreditation. Colleges, universities, and/or programs are accredited when they meet a set of standards and criteria developed by a group of peer institutions. Schools are accredited either nationally or regionally. National accreditation is usually reserved for vocational or religious institutions and for-profit schools. This accreditation is seen as less prestigious and credits from these institutions may be more difficult to transfer. Alternatively, regional accreditation is a more rigorous process granted to non-profit institutions, both online and traditional. One of six regional accrediting bodies determines accreditation standards and eligibility. A third kind of accreditation is program-based. Organizations such as the Engineering Accreditation Commission, the National Council of Examiners for Engineering and Surveying, and Accreditation Board for Engineering and Technology accredit individual engineering schools or programs within universities. Although private organizations determine accreditation standards and acceptance, they are overseen by the Department of Education (DOE) and the Council for Higher Education Accreditation (CHEA). These two oversight bodies recognize accrediting agencies and certify them to determine accreditation standards. The DOE is a government agency in charge of federal education money and policy objectives. The CHEA is an organization comprised of college and universities to recognize accrediting best practices. Read the list of all accredited schools on the DOE's or CHEA's websites to ensure you're getting the best program. While engineers with a bachelor's degree have a high earning potential throughout their careers, master's in engineering management graduates begin with better salaries and see their incomes climb much faster. Data from Payscale demonstrates an engineering manager makes more than $100,000 annually within the first five years of graduation, compared to students who hold only a bachelor of science in civil engineering. In fact, a BS degree holder can take up to 20 years to make a salary in line with what master's degree holders typically earn directly out of school. An engineering management career can be very lucrative. Average salaries vary from state-to-state, but other factors may impact your earnings. According to data from the U.S. Bureau of Labor Statistics, the top five states for engineering management salaries all offer annual wages at or above $160,000. Two of the five states -- California and Texas -- are also rated as the number one and number two states for employment opportunities for engineering managers. This list includes four Western states and several of the most populous states in the country. An online master's in engineering management can lead to many career opportunities. By combining business and engineering skills, the master's degree prepares graduates for roles in either sector, and particularly the intersection of the two. These jobs are open to individuals well-versed in engineering knowledge, industry customs, interpersonal skills, and professional communication. With a combination of experience in the field and an advanced degree, architects and engineers can advance to positions in management. Managers oversee projects, plan new developments, and coordinate between contractors, designers, and clients. A construction managercoordinates labor, plans the budget, and oversees production. He or she also works with engineers, clients, and construction personnel. An industrial engineer is committed to making industries more efficient and effective. From redesigning supply chains to building new machines, industrial engineers benefit from a business-facing engineering management master's degree. Maintaining and improving the country's infrastructure -- roads, buildings, pipes, bridges -- requires civil engineers. An engineering management MS degree prepares civil engineers for leadership positions within their public or private companies. A mining engineer develops plans to deconstruct natural structures. Similar to the project or construction management roles in civil and structural engineering, a mining leader coordinates the blue collar and white collar workers. Professional organizations connect peers in the industry to foster networking and professional relationships. These organizations promote entrepreneurship, continuing education, and industry development, and many engineers join professional organizations specific to their speciality. The NSPE holds conferences and National Engineering Week. This is a large industry group open to all engineers who have their PE license. Promoting women in an industry where they are traditionally underrepresented, the Society of Women Engineers holds several networking events to facilitate professional connections among women. The AAES invites engineers from different disciplines and industries to interact with one another to achieve a common purpose. For Government engineers can work with private sector managers, while electrical engineers can network with software engineers. Many engineering management master's students pay for their degree by working during school. However, there are alternative ways to fund an education. Completing the FAFSA (Free Application for Federal Student Aid) determines a student's eligibility for scholarships, grants, and loans. Many schools also offer stipends for graduate work, and scholarships or grants for merit or need. Employers may also have a program for graduate education that can help.